A truly unique scar cream to address "barrier disruption," a major symptom in problem scarring. A flawless, healthy barrier is the key to scar-less healing. Hyper-Heal's ceramides, cholesterol and other essential fatty acids are delivered in a transdermal formulation under the skin's surface. They move upwards to replenish and rebuild the stratum corneum barrier from the inside out. Ceramides stimulate elastin and fibroblast cell growth, which produce both collagen and collagenase to balance scar remodeling and avoid over or under production of collagen. This can result is smooth, flat scar-less healing. "I have seen a remarkable improvement in the scar." I had throat surgery 2 months ago performed by a thoracic surgeon. From the moment I saw the scar, I was very unhappy with it. My surgeon told me that the only thing that would help was time, however 2 weeks after surgery, my dermatologist prescribed a cream. The cream made it red, made it itch, and in my opinion, made it worse. I also tried the over-the-counter cream Mederma. Nothing seemed to improve the scar. About 2-3 weeks ago, I remembered that I had Hyper-Heal Cream from a previous surgery 3 years ago. I began using it and since that time, I have seen a remarkable improvement in the scar. It has gotten smaller, has faded, and it is no longer sore. I am so thankful for this product. It is unbelievable how quickly you see results. I just ordered another large size bottle and am so glad I found ReJuveness!! Thanks! "I was skeptical about the Hyper-Heal Scar Cream"
prior to making a purchase and I just wanted to say thank-you. I had two quarter-sized scars, one red and lumpy and one white and lumpy. Literally, in 6 weeks of using the Hyper-Heal Cream, both scars are pretty much invisible unless you know exactly where to look. I have a hard time finding where they once were. Thanks for developing such a great product. I was so worried about these scars because they were on a visible part of my neck for everyone to see and now they are perfectly healed and not noticeable. Thanks so much! "I cannot believe how quickly my scar has healed." I have been using the scar cream for one month now and cannot believe how quickly my scar has healed. My doctor is amazed at the progress! "My doctor was amazed at how fast and how nice the incision was healing." "I want to thank you for such a wonderful cream "
"I want to thank you for your great products!" "I have tried everything and nothing worked. Your scar cream really works!" "Finally, a scar cream that actually does what it claims to do..."
"Your products have been working like a miracle on my problem skin since August!" I have seen a significant improvement in size and appearance that I was unable to get before! "Your Hyper-Heal Cream has significantly improved the appearance, as well as shrunk the size of the dark burn scars." "Your Hyper-Heal cream worked well for me." It healed my indented scarring 80% and helped to make the ice-pick scarring shallower. Thank you for this - I really did appreciate it. Yours Sincerely, A.S.
"I have told quite a few people including my plastic surgeon." "I'm looking forward to trying your other products." "I just wanted to tell ReJuveness and future customers that these products really work." I have been using them for about three months and I see a significant difference in my scar. I had a horrible case of acne which left a terrible scar right between my eyebrows and now I can barely see it. I had tried other products in the past, some of which were more expensive and nothing seemed to work. I will continue to use them until I run out and probably reorder again so it fades even more. Thank you for these fabulous products. So if you are out there with a scar which is affecting your self esteem, order these products, you have nothing to lose except your scar!! Lauren O. "I am STUNNED how good they work." "I do not know how to explain it, but my face is already appearing smoother and clarified." "I know it has only been five days, but this is the best scar cream I have ever tried so far!" I have researched the ingredients, only because I am an ingredient freak--and I found the major ingredients on (the Internet). It makes sense to me, even though I am not a scientist... Thanks JS Austin Tx.! "Thank you and please, please do not stop making Hyper-Heal Cream!" 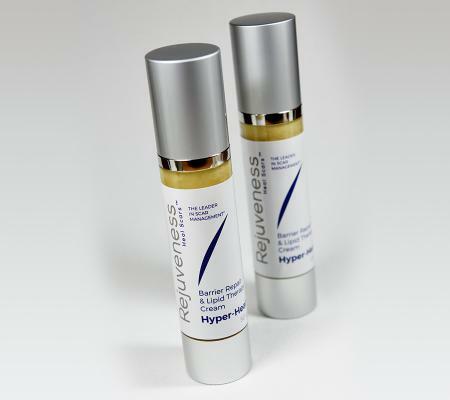 What is ReJuveness Hyper-Heal scar cream? What separates Hyper-heal scar cream from other scar creams? First of all Hyper-Heal scar cream is silicone free. The reason why we won’t put silicone in our cream is a safety and toxic concern. There are good reasons not to include ingredients that are known toxic forms of silicone . In short, the most decisive order of the decades long silicone breast implant class action lawsuit was that the more viscous and fluid forms of silicone such as gels, oils and liquids are toxic to the body and can cause serious illness. Since 1999 researchers have known Hypertrophic scars and keloids lack the protective skin cover and are open gateways into the body. What forms of silicones are safe for the body? In response to the Silicone breast implant lawsuit, Dow chemical was forced to offer a safer breast implant. The elastomer silicone shell which wouldn’t break apart and disintegrate in the body and was strong enough to contain the silicone gel that migrates through and wreaks havoc in the body due to its large toxic molecules are the same GE engineers that eventually developed and still manufacture Rejuveness Pure silicone sheeting for scar management. The reason these silicone scar creams get results is a local toxic response. Cytokines and macrophages which find their origin along with the blood that carries them in a silicate based bone marrow, seem highly reactive to silicone. The problem is that the large molecules of the gel and liquid forms of silicone are too big and cannot be broken apart by normal toxic response and macrophage elimination. The body takes the next defensive step and has a Granulomatous Reaction to Silicone. (Granulomatous Reaction to Silicone Injection Lixia Ellis et al) These silicone granules that contain large silicone molecules have been found in high numbers at the excised sites of hypertrophic scars treated with silicone gel sheeting. The full implication of the long lasting effects of these silicone granules is unknown but it seems they stay there indefinitely. My question is given the illness fostered by silicone breast implants why chance and allow it? Rejuveness as a manufacture won’t be party to it and therefore do not included silicone gels and liquids. The toxicity of liquid forms of silicone are known but the secret remains covered . A recent case of a high profile TV infomercial hair products manufacture using large amounts of silicone in their shampoos and conditions has a host of lawsuits of plaintiffs claiming their hair is falling out and going bald. ilicone free Hyper-heal scar cream is a combination of recent lipid and transdermal technology enhancing traditional scar modalities. Post surgical patients and clinicians are reporting accelerated healing and in many instances a near scar-less appearance at the lesion site. Patients and clinicians are also reporting an accelerated heal time in keloids with the most dramatic effect in older more difficult to remedy Keloids. A key ingredient is Linolecleic acid within a phytophingisine base induces collagenase production, the naturally accruing enzyme that digest and eliminates excess scar tissue. Apply a very small amount and spread evenly over affected area twice a day. Recent advancements in lipid and trans dermal technology are what make this scar cream especially effective. The combination of ingredients in the scar cream have been shown to induce collagenase production, the naturally occurring enzyme that helps digest excess scar tissue. The scar cream attacks the problem in several ways. First of all, the scar cream delivers essential lipids and bio-molecules beneath the surface of the skin where these ingredients cultivate a favorable healing environment. The scar cream also helps rebuild the compromised strateum corneum, an area that needs to be targeted to counteract hyper prolific scarring. 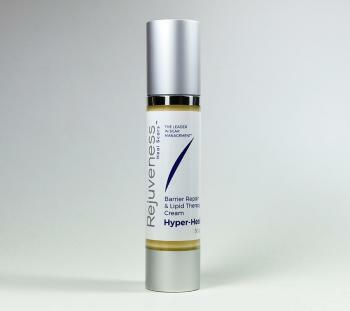 Rejuveness Hyper-Heal scar cream produces a dramatic improvement in many patients, resulting in a flattening, evening, and fading of discolored skin. The unique way in which this scar cream facilitates the healing process will visibly help diminish the appearance of scars, and in some cases cause them to be almost undetectable. Initial results of ReJuveness Hyper-Heal Scar Cream -- as reported by patients and clinicians -- has been nothing short of amazing! Customers with skin problems ranging from acne scars to surgical scars and burns have written to us to share their success stories and remarkable outcomes they've experienced from using our Hyper-Heal Scar Cream. Testimonials "I have seen a remarkable improvement in the scar." I had throat surgery 2 months ago performed by a thoracic surgeon. From the moment I saw the scar, I was very unhappy with it. My surgeon told me that the only thing that would help was time, however 2 weeks after surgery, my dermatologist prescribed a cream. The cream made it red, made it itch, and in my opinion, made it worse. I also tried the over-the-counter cream Mederma. Nothing seemed to improve the scar. About 2-3 weeks ago, I remembered that I had Hyper-Heal Cream from a previous surgery 3 years ago. I began using it and since that time, I have seen a remarkable improvement in the scar. It has gotten smaller, has faded, and it is no longer sore. I am so thankful for this product. It is unbelievable how quickly you see results. I just ordered another large size bottle and am so glad I found ReJuveness!! Thanks! "I was skeptical about the Hyper-Heal Scar Cream" prior to making a purchase and I just wanted to say thank-you. I had two quarter-sized scars, one red and lumpy and one white and lumpy. Literally, in 6 weeks of using the Hyper-Heal Cream, both scars are pretty much invisible unless you know exactly where to look. I have a hard time finding where they once were. Thanks for developing such a great product. I was so worried about these scars because they were on a visible part of my neck for everyone to see and now they are perfectly healed and not noticeable. Thanks so much! "I cannot believe how quickly my scar has healed." I have been using the scar cream for one month now and cannot believe how quickly my scar has healed. My doctor is amazed at the progress! I was very upset with the inch-long scar I got due to minor surgery right on my cheek! I now am so happy I had the surgery as the scar is healing so well! Thank you ReJuveness!! You're a life saver (or face saver in this case.) Tom, IA "My doctor was amazed at how fast and how nice the incision was healing." The scar cream began working right away. I recently had surgery and began using the scar cream after the staples were removed." Kim, Hilo, HI "I want to thank you for such a wonderful cream " A cream that actually works and is helping repair my scar on my face. I have wasted money on other products such as Mederma & Scar Guard and I only wish I would have known about your cream because it has really helped my appearance and given me back a lot of my self-esteem. I love using your cream & have told several of my friends & family it works like nothing else. Please do not stop making this product. This is my second order placed and I will continue to use the silicone & the cream...your product has helped me heal on the outside, but most of all you can see what it has done to make my inside so very happy that I try not to get choked up. Thank you again, Deborah, Georgia "I want to thank you for your great products!" My-10-year old daughter had an indented burn scar on her leg from having a wart removed with freezing. It was very noticeable and made her feel bad. About three months after the freezing I found you folks and ordered the Hyper-Heal Cream and the silicone sheets. I received it that same week. After using both products together for about two weeks continuously, her scar improved dramatically. The scar seemed to blend in with the rest of her skin and it filled in where it used to be sunken in. We continued to use the same regimen. Now it has been 3 months and I can't believe it. I no longer see the scar and you can't tell. Thank you, Linda, Gainesville, FL "I have tried everything and nothing worked. Your scar cream really works!" My scars have become lighter and are disappearing after only two weeks - that's why I am coming back for more. This is great! I.A. New Hyde Park "Finally, a scar cream that actually does what it claims to do..." I want to thank you from the bottom of my heart for this product. Ruth, BOSTON "Your products have been working like a miracle on my problem skin since August!" I just want to say thank you all! Tamaki, (Japan) I have seen a significant improvement in size and appearance that I was unable to get before! I have been receiving Kenalog injections for my keloid scars that range in age between 3 months and 10 years old. The injections didn't last and seemed to make my keloids worse. After using your scar cream Hyper-Heal for just two weeks. Tu, Las Vegas, Nevada "Your Hyper-Heal Cream has significantly improved the appearance, as well as shrunk the size of the dark burn scars." I have a dark complexion with dark burn scars. I have been using Hyper-Heal on my face and my friends have noticed the healthy glow it now has. L.R, California "Your Hyper-Heal cream worked well for me." It healed my indented scarring 80% and helped to make the ice-pick scarring shallower. Thank you for this - I really did appreciate it. Yours Sincerely, A.S. "I have told quite a few people including my plastic surgeon." l have had a lower blastoplasty 5 weeks ago, and thank to your wonderful product, you can hardly see the scarring. It's only been such a short time. My doctor told me in 4 to 6 week the scarring should get worse before it gets better. They told me in about 6 months it should fade away. But thanks to the Hyper-Heal Cream, in just 5 weeks it's just amazing. It's hardly noticeable at all. l apply it morning and night. Thank you so much for such a wonderful product. Janice, LA "I'm looking forward to trying your other products." A very satisfied scar cream customer.....Kindest regards, S.M., New Mexico "I just wanted to tell ReJuveness and future customers that these products really work." I have been using them for about three months and I see a significant difference in my scar. I had a horrible case of acne which left a terrible scar right between my eyebrows and now I can barely see it. I had tried other products in the past, some of which were more expensive and nothing seemed to work. I will continue to use them until I run out and probably reorder again so it fades even more. Thank you for these fabulous products. So if you are out there with a scar which is affecting your self esteem, order these products, you have nothing to lose except your scar!! Lauren O. "I am STUNNED how good they work." 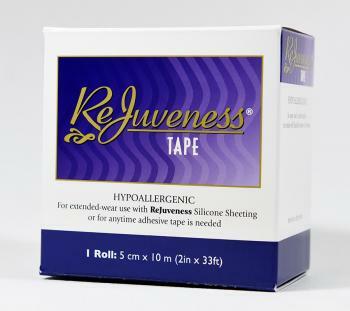 The ReJuveness Hyper-Heal cream and silicone sheeting scar sheets combo is unbelievable. I can actually look at my self in the mirror again . You have no idea how grateful I am to you and your products. Betty, Miami FL "I do not know how to explain it, but my face is already appearing smoother and clarified." Just wanted to let you know I received my ReJuveness Hyper-Heal Cream just 5 days ago. Ju, NYC "I know it has only been five days, but this is the best scar cream I have ever tried so far!" I have researched the ingredients, only because I am an ingredient freak--and I found the major ingredients on (the Internet). It makes sense to me, even though I am not a scientist... Thanks JS Austin Tx.! "Thank you and please, please do not stop making Hyper-Heal Cream!" I have new and very old acne scarring, and I like the new appearance - and especially like the texture - of my skin. I had dermabrasion years ago and was not satisfied with the results. Lisa, Albany NYIt is believed because the skin covering problem scarring is an open gateway into the body potentially toxic ingredients such as silicone liquids, oils and gels should be avoided. Hyper-heal cream is Paraben and silicone free. Do not use on open wounds. For reestablishment of a compromised stratum corneum found in keloids, hypertrophic scars ablated skin. Indicated to restore moisture retention of the stratum corneum. .
Glycoproteins (Technologically derived fraction which is rich in oligopeptides), Ceramide 3 (Identical human 3-lipid structure), Ceramide IIIB, Ceramide 6 (Identical human 6-lipid structure), Ceramide 1 (Identical human 1-lipid structure, in combination with linoleic acid), Cholesterol, Aloe Vera, Soy, and 1% Lactic Acid.Also in the Hyper-heal formula is a refined emulsified form of linioic acid-2 , a prime ingrediant found in popular scar lotions such as emu oil, bio oils . For centuries South Africa tribeman's used similar form of these oil found in the skin of boa contrictor snake oil to rid keloids. This product DOES NOT CONTAIN PARABENS.